January 16th 1938. Jazz has been called "America's classical music," a label that does more than just recognize its American origins. The label also makes the case that jazz is worthy of aesthetic consideration alongside music usually thought of as "classical." In the current era, when programs of Duke Ellington and J.S. Bach often draw the same highbrow crowds, that argument hardly seems controversial. 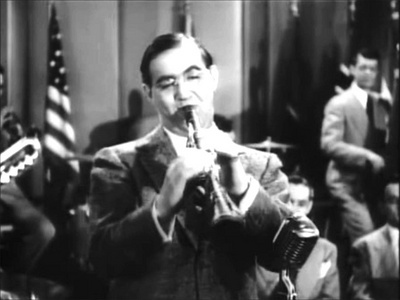 In the 1930s, however, the notion was almost laughable, which is what made Benny Goodman's January 16, 1938, concert at New York City's famed Carnegie Hall so revolutionary. Goodman and his supporting cast claimed a new place for jazz on the American cultural scene that night, in what has come to be seen as the most important jazz concert in history. Benny Goodman was at the absolute height of his legendary career when his publicist first suggested they book Carnegie Hall. He was a star on radio, on stage and on film, and the label "King of Swing" was already attached permanently to his name. So outlandish was the suggestion that a jazz band might play inside the citadel of American high culture, however, that Goodman is said to have laughed the idea off at first. Once he warmed to the notion, however, Goodman threw himself into the task with characteristic passion. In addition to numbers from the regular repertoire of his own band—which included the legendary Harry James on trumpet, Lionel Hampton on vibraphone and Gene Krupa on drums—Goodman planned a program featuring a brand-new "Twenty Years of Jazz" piece and an extended jam session featuring stars of the Duke Ellington and Count Basie orchestras. The concert sold out weeks in advance, with the best seats fetching $2.75. It would be another decade before anyone who was not in the audience or listening on the radio that night would hear the famed concert. All recordings of the show were presumed lost until Goodman's sister-in-law came across a set of acetates in 1950. By then, the performance had already become the stuff of legend—particularly the stunning, unplanned piano solo by Jess Stacy on "Sing, Sing, Sing," the evening's final number. The album made from the recovered acetates became one of the first 33 1/3 LPs to sell over a million copies. The eventual discovery of the aluminium studio master recordings led to high-quality CD reissues in 1998, 2002 and 2006 of the legendary Carnegie Hall Jazz Concert.